Talking Jigsaw Puzzles | "é rayhahn, rayhahn"
I finally found the last of the Talking Jigsaw Puzzle series at a reasonable price, and I’ve completed the collection with The City Hall “Talking Puzzle” by Buffalo Games. The premise for this one is the same as past puzzles: you must first complete each of the 4×4 piece rooms, and then you use the “conversations” between the rooms as clues to the ordering of the rooms. This particular puzzle had a minor twist in that it had an east and west side to it, and brick between rooms. The only real complaint I have is like with all of these puzzles — the edges don’t distinguish themselves well enough, and you’ll end up having to resort to using the pattern on the back to put some in their proper place. Still, it was as fun to put together as all the others in the set. Slowly the last of the Talking Jigsaw Puzzle series are coming home to roost, this one being The Hospital “Talking Puzzle” by Buffalo Games. These puzzles require you to not only assemble each of the 4×4 piece hospital rooms correctly, but then you have to position each of the windows in a way that the conversation clues make sense. They’re fun to work on. 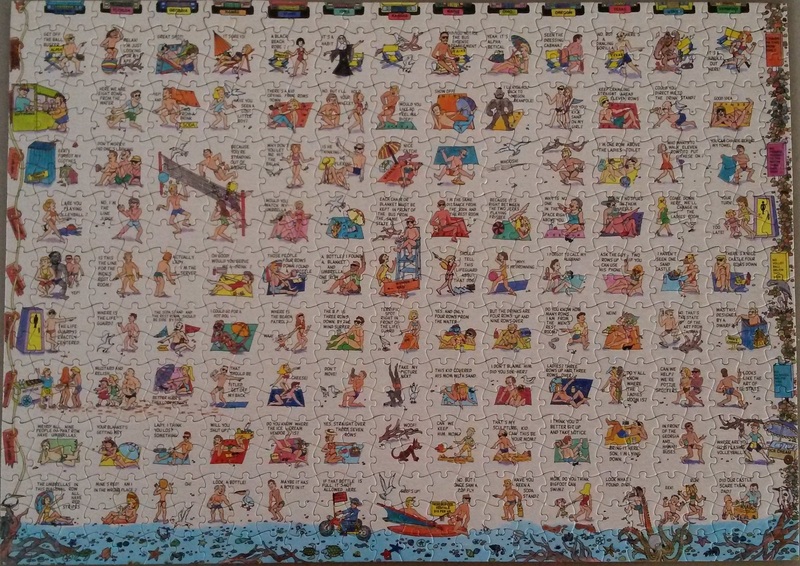 Added a fourth Buffalo Games “talking jigsaw puzzle” lately (previous: The Office Building, The Fitness Center, The Beach). 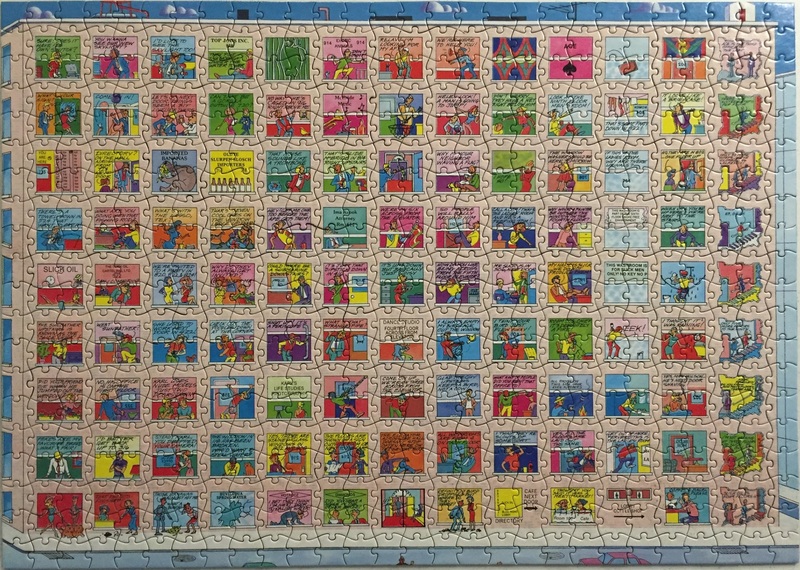 In summary, these puzzles require you to complete each of the 4×4 squares before you can then find their correct location based on the clues given in the various conversations and scenes on each one. 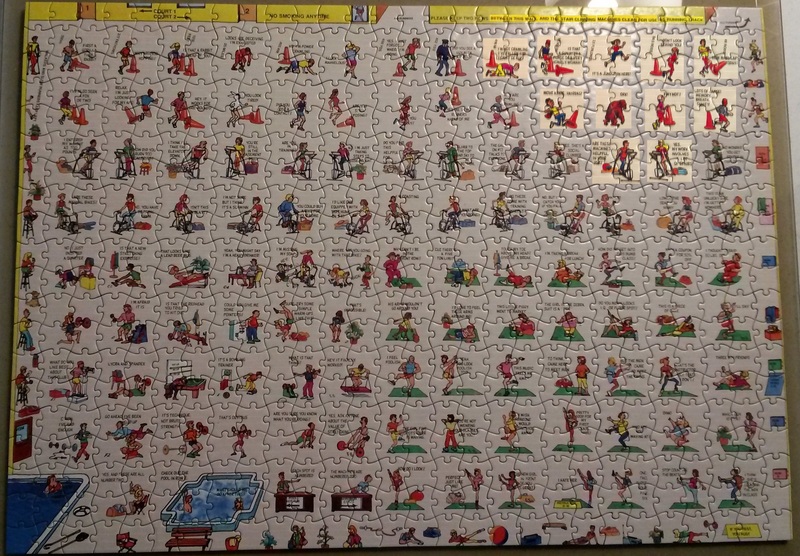 At this point, I believe that the only two other Talking Jigsaw Puzzles are The Hospital and The City Hall. Snagged a third Buffalo Games “talking jigsaw puzzle” the other day, to go with The Office Building and The Fitness Center puzzles that I already had. 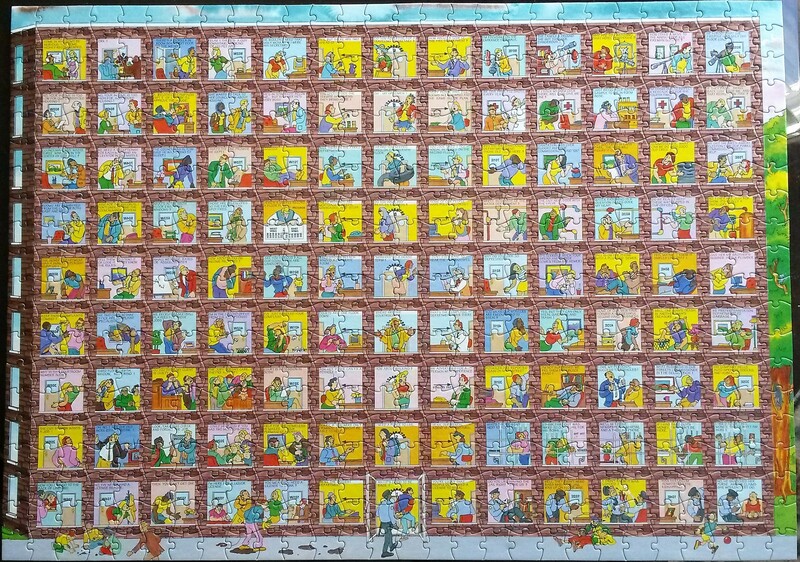 To recap, with these puzzles you need to complete each of the 4×4 squares before you can find their correct location based on the clues given by the various conversations and scenes on each one. After the entertainment we got from putting together The Office Building by Buffalo Games, I decided to see if I could pick up one of the other “talking jigsaw puzzles”, and managed to find a reasonably priced Fitness Center (paired with another of The Office Building, which I gifted to my AZ nieces and nephew). Again, not only do you need to assemble each of the 4×4 fitness center workout spaces correctly, but you then must place each one in the correct spot based on clues given by the conversations on the puzzle. I was surprised that these are such collectors items. They came out in the early ’90s, from the looks of it. I’ll keep monitoring for any of the others to be offered at anything resembling affordable. Stay tuned! 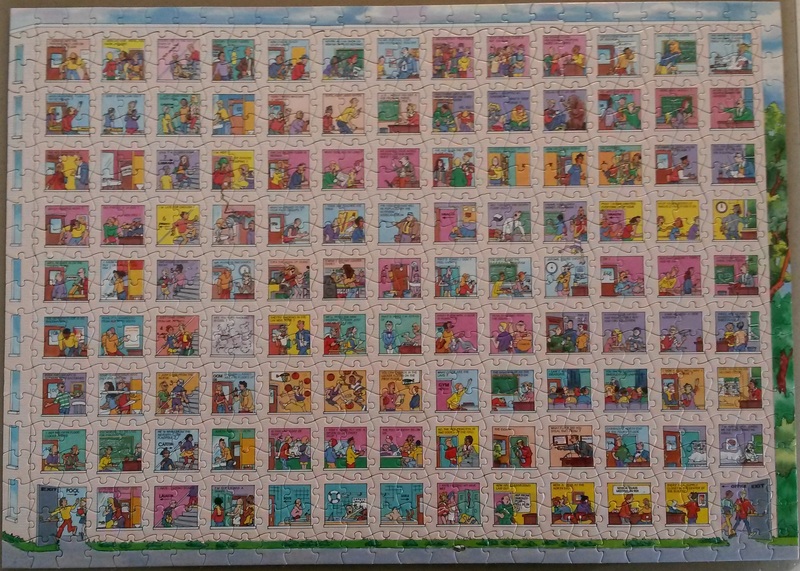 One of the items I laid out for the Snow Day Party we hosted was a fun puzzle that we’d enjoyed working on one time in the past, The Office Building “Talking Puzzle” by Buffalo Games. 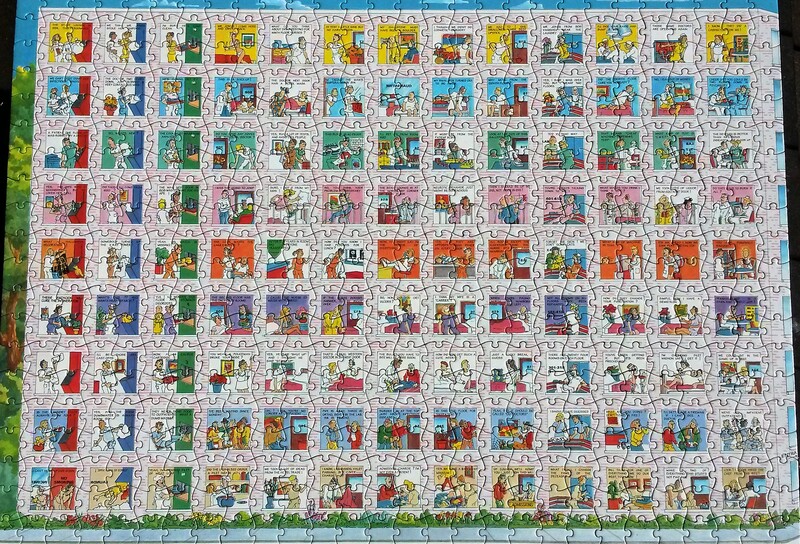 Not only do you need to assemble each of the office rooms/windows correctly, but you then must place each window in the correct spot based on clues given by the conversations on the puzzle. It’s a fun challenge.